If you have events for inclusion in the weekly Notice Sheet then do speak to any of the Ministry Team, or ring Phil Hearing (Parish administrator) on 01638-723010 on Wednesday mornings, when, usually, it is compiled. Howard & Bren (Soham Distribution Co-ordinators). Sundays 9.30am Junior Church in Social Centre (In Church 3rd Sunday). The Junior Church needs teachers/helpers, please offer your services. Mondays The Three Rivers Prayer Group meets on a weekly basis to pray together about current affairs and needs for approximately one hour, and would welcome any who would like to join us, whether you wish to pray aloud or in your heart. We meet at 1 West Street, Isleham at 1.30pm. Tuesdays 8.15am Morning Prayer at the Social Centre. 9am to 12 noon Coffee Morning in Social Centre (except March 29). A short (15 to 30 minutes) Evening Prayer service will be held every Tuesday at 4.30pm.in the Limestone Close community room. 6.30pm Choir practice in the Social Centre - New singers welcomed. Contact Mark Liversidge (01638 781696). 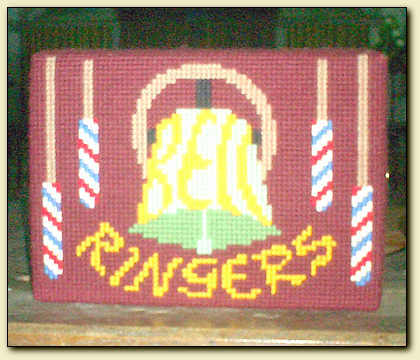 8pm Bell ringing practice - Beginners welcomed! Contact Ruth Ogden, the Tower Captain, for more info. Fordham Day Centre Lunch Club -Fordham Day Centre is a lunch club for older people and meets on the 1st and 4th Wednesday of each month from 10.30am to 2.30pm. April 26 Mums+ is a monthly coffee morning for fun, conversation and sharing our questions of life, faith and parenthood � all ages welcome. For more details contact Laura Cox-Watson 01638 724839. April 29 Monday Prayer Group - The prayer group meets at 1.30pm on Mondays for an hour of prayer. We meet at 1 West Street, Isleham. May 6 Monday Prayer Group - The prayer group meets at 1.30pm on Mondays for an hour of prayer. We meet at 1 West Street, Isleham. Sessions will usually run on the first Thursday of each month, 9:30 - 1pm in Bishop Woodford House Ely, led by Rev. Jonnie Parkin, starting on October 4. Please contact Mel if you are interested in attending. Volunteers are needed for the Three Rivers Car Scheme. Please get in touch with Muriel Hoodm on 01638 666722. See the Three Rivers Group web site for Mother's Union programme of meetings and events. Thank you to all those who helped arrange and attended our Lent Lunches. A good Advent Carol Service at Soham on Monday, followed by a light lunch and time to socialise. Enjoyed by all who came. An afternoon Tea Party at St Andrew�s, Isleham Social Centre, to celebrate the anniversary of Mary Sumner, founder of the Mothers' Union. The Garden Party at the Bishop�s Garden was a beautiful evening. Entertainment by the Ely Imps was great. The trip to Denny Abbey and Farm Museum was a very pleasant afternoon. Hazel Williams spoke to us on �MU Fundraising and Communications�. An opportunity for quiet reflection and prayer. Tuesday 21 March from 10am � 2.30pm at St John�s Church, Waterbeach. Entitled �Praying in Lent � Letting Go�, led by Rev�d Valerie Kilner � Coffee/Tea provided. Bring your own packed lunch. For more information and a lift contact Helen Banyard on 721616. Three Rivers Lady Day service was at Burwell on March 24, followed by lunch. The MU had a very interesting evening on February 15 hearing Sue Murfitt talk on the Life and Culture of China�. MU is holding a sponsored walk on Saturday October 15. Meet at Burwell Church at 3pm. There are two walks. One, along the Dyke to Reach (5 miles) and the second, circuits of the churchyard at Lode (for the less mobile). Jenny and Ren Bowen and Helen Banyard are walking please see Helen, 721616, for sponsor forms and/or further information. 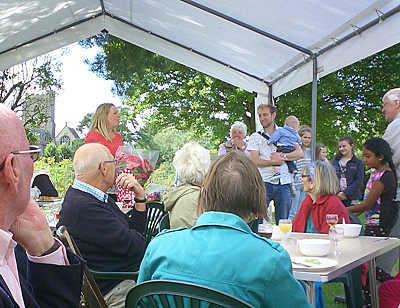 We celebrated 140 years of our organisation with a Garden Party at Fordham Vicarage on 9th August � Mary Sumner Day, who founded the Mothers� Union. Some members from Burwell joined us, as did over twenty of our members and supporters and we enjoyed afternoon tea with the marquee decorated with bunting made by our members (thanks to Jackie Naylor for sewing it together). A big thanks to all those who contributed sandwiches, scones and cake which were much enjoyed and to Jenny Bowen for her help with providing the pretty crockery etc. On Thursday July 21 we enjoyed a super outing through the Suffolk countryside. A big thank to the members who helped make the MU bunting for parish social events, particularly Jackie Naylor and Jenny Bowen for their input. Our branch meeting on Thursday April 28 was at St. Peter�s Snailwell, where Dr Stephen Taylor told us the history of our round towered church. It was followed by a lunch at the George & Dragon, Snailwell. The Deanery Lady Day Service which this year took place at Lode Church on Monday April 4. Our three Mothers' Union Lent Lunches have been very successful and raised over �460. We are sending all of this money to MU Projects Worldwide. 2 x �100 � �Salt and Light� � which establishes self help groups in churches to help the wider communities. 4 x �40 � �Going the extra mile� �to fund development co-ordinators. 2 x �50 � �Helping Hand� � training parenting facilitators group. Our final Lent lunch was at Chippenham on Wednesday March 9 at Chippenham Village Hall from Noon�1.30pm. 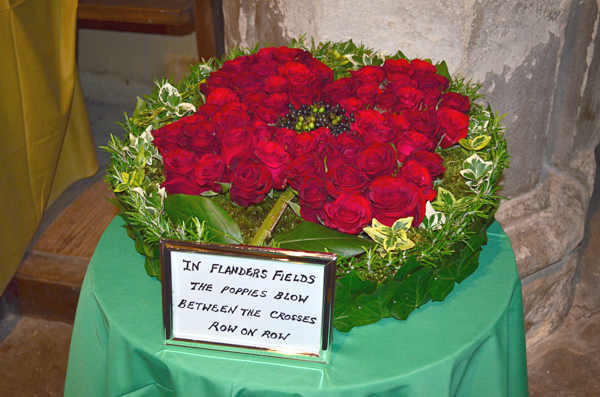 This year this service for everyone was on Friday March 4 at St. Andrew�s Church, Isleham. It was written by the women of Cuba and has a Caribbean flavour. 10am Coffee, lemonade and Cuban biscuits. 10:30am Service, followed by refreshments in Isleham Social Centre. We had a small choir to lead the singing . 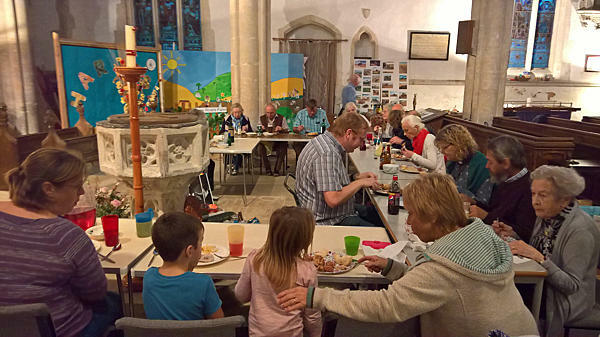 Another great turnout for our second Lent Lunch � this time at Isleham. The homemade soup, sandwiches, fruit, tea and coffee were again very popular. A big thank you to Gill Savage and Mary Wightman for the lovely soup and Angie and Betty Ashley for their contributions. Our third and final Lent Lunch is at Chippenham Village Hall on Wednesday March 9 from noon�1.30pm. Everyone is welcome. All proceeds will go to MU project overseas and we will announce our final total of money raised and the projects supported later in the pewsheet. Our first Lent Lunch on a cold day was a great success. The weather brought out many who enjoyed the homemade soup, sandwiches, fruit, tea and coffee at the Victoria Hall, Fordham and we had to get out extra seating. A big thank you to Jenny Bowen, Jacky Naylor and Jean Bayes for all their hard work in giving us an enjoyable lunch and a time to socialise. We had a very good meeting on February 8, with many thanks to Howard Laver who gave us a very interesting talk on Local Foodbanks. A big thank you to Gaynor for a very enjoyable Craft and Coffee morning demonstration of two delicious cakes � Blueberry Muffins and Hello Dolly Bars. Some of us enjoyed lunch at La Hogue Caf�. This is the third year Three Rivers Mothers� Union is supporting this campaign. There will be prayer trees with the opportunity to pray for many who suffer or have suffered physical and mental violence. A very big thank you to everyone who has donated toiletries etc. to women�s refuges in Cambridgeshire during the 16 Days of Activism. The response has been overwhelming and many of the donations have already been handed on to those who will benefit from them and your gifts, thoughts and prayers are much appreciated. Members of the Three Rivers branch of the Mothers� Union enjoyed an excellent Christmas Lunch at the Walnut Tree, Worlington. The food and the company contributed towards a very relaxed and enjoyable time together. Deanery MU Coffee Morning was held at Chippenham Village Hall on Friday September 25. Stalls included Cake & Produce, Books, MU Cards and Refreshments. Our AGM took place at Fordham Victoria Hall September 21. Day Trip to Elveden with lunch. A big thank you to Gaynor and Jenny for the smooth organisation of our trip to Highway Garden Centre and the Van Dal Shoe Retail Outlet. The weather was fine and a good time had by all. Jo Wibberley, Diocesan Vice President, has been cycling around our churches in the Deanery these past couple of weeks, in all weathers. Members of the MU have also accompanied her. Thanks to everyone who gave their time, especially Helen. A good members� day too on Wednesday May 20 in Cambridge. Ten members attended the Diocesan Garden Party and enjoyed the setting and the roses. It was an excellent evening with strawberries, shortbread and cream with fizz! The Ely Imps Singing Group entertained us and it was a good opportunity to mix with other MU members. A great talk about Fordham's history by Dr Stephen Taylor at Fordham Church on St Barnabas� Day. Many thanks. Kathy Carver gave an excellent talk about heart problems and the care we all need to take to keep our hearts healthy. It was lovely to see many new faces as the talk appealed to many members of our congregations. We made a visit to the National Stud at Newmarket on Friday April 24. Spring Diocesan Day and annual meeting was held on Monday April 20 at St Peter's in March 10am�1pm. Our Deanery Lady Day Service was on Wednesday March 25 in Lode Church. 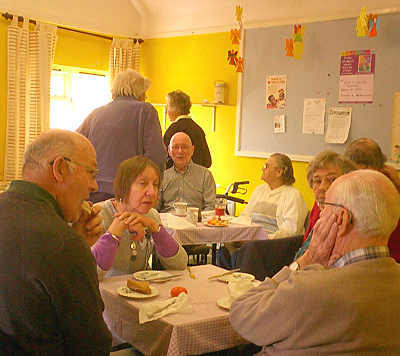 This year we held Lent Lunches at Fordham, Isleham and Chippenham. A big thank you to those who have provided homemade soup and sandwiches and those who have supported these lunches, our final total was over �300 which will go to MU Worldwide projects. 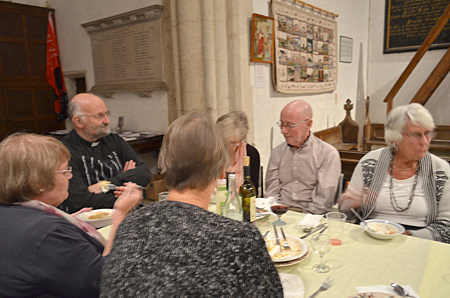 The second Lent lunch was held in Isleham on March 5. We met on Wednesday February 4 at Chippenham Village Hall where our speaker is Sue Potts who took the title �God�s work � our hands� as her theme. We met for a craft and cookery demonstration with coffee and cake at Gaynor�s home in Snailwell , followed lunch at La Hogue. Sixteen members enjoyed a lot of excellent food and laughter in a lovely location at The Beeches, Isleham. This is the second year the Mothers� Union has supported this social action and there is a prayer tree in each of our churches. Please read the information provided with the tree and use the labels provided to write a prayer for those who have or still suffer from domestic abuse. For more information concerning domestic abuse both in Britain and worldwide contact Helen Banyard 721616. A big thank you to Gaynor Ryan for demonstrating and teaching others to arrange a Christmas Table Centre, ably assisted by Jenny Bowen. A delightful, relaxing evening, enjoyed by all who attended and a request for another similar evening nearer Easter was suggested. Money donated will go to MU charities. The Mothers� Union AGM is on Friday September 26 at Chippenham Village Hall from 10am. Followed by lunch at La Hogue Caf�. All welcome. Janice Pope and members of Sheringham MU visited Ely and Isleham on Friday July 11. They met up with the Three Rivers Group MU for Afternoon Tea in the gardens of the Social Centre followed by a service at St. Andrew�s Church, Isleham. Thanks so much to Malcolm and Liz Barber for inviting us to their home for a super and illuminating talk on the Knights Templars. It was both fascinating and informative and we could have stayed much longer and heard more. Perhaps we can persuade him to give a further talk sometime in the future. 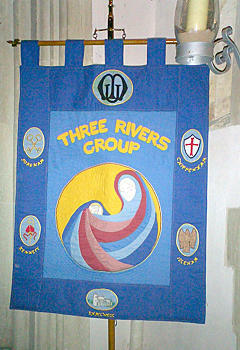 Our new branch banner was blessed at the Holy Communion Service held at Chippenham Church on Monday 12th November, 2012. It was paraded at the Commissioning Service on Saturday 24th at Ely Cathedral. W H Smith and local newsagents. Locally it can be bought for �2.50 from Central House, Burwell, W H Smith Cambridge and Tindalls Newsagents Newmarket and Ely Station. It is an excellent family magazine and we encourage you to give it a try. The purpose of the Mothers� Union is to be specially concerned with all that strengthens and preserves marriage and Christian family life. To uphold Christ�s teaching on the nature of marriage and promote its wider understanding. Christine Hewitt was confirmed on Saturday November 24 at at Ely Cathedral. 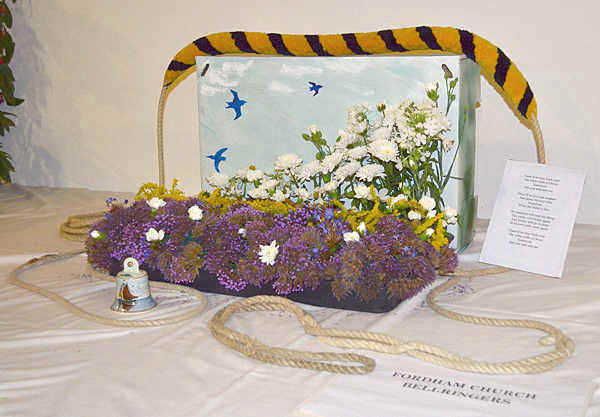 There will be a Flower Festival in the church at Snailwell on May 26 and Sunday May The Hymn-themed floral arrangements will be on display from 10.30am�6pm and refreshments will be available. The festival ends with Songs of Praise on Sunday at 4pm. 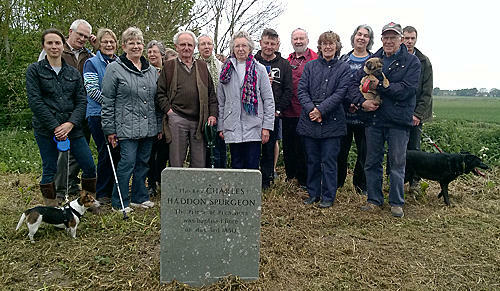 On Saturday May 5 over 30 people (and some dogs) walked from the village to the riverside monument which commemorates the baptism of Charles William Haddon Spurgeon, The Prince of Preachers, in the River Lark at Isleham on May 3 1850. In a short act of worship we sang Amazing Grace and How Great Thou Art and recited the Lord's Prayer. 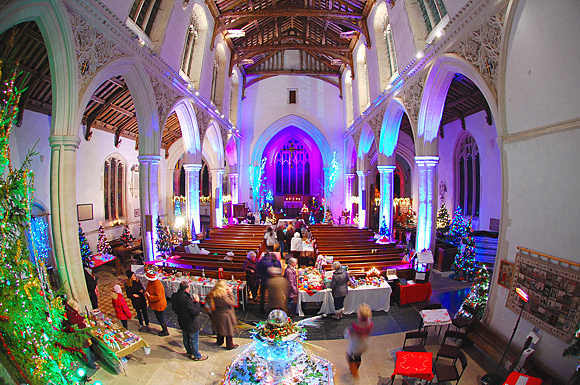 The Church was open to view over 40 illuminated Christmas trees decorated by local groups and businesses and attracted many visitors. The Community Carols service on Sunday December 10 was very well attended. The institution of the Rev�d David Cleugh as Rector of the Three Rivers Group by the Bishop of Ely was held on Friday, October 20 in St Peter and St Mary Magdalene, Fordham. 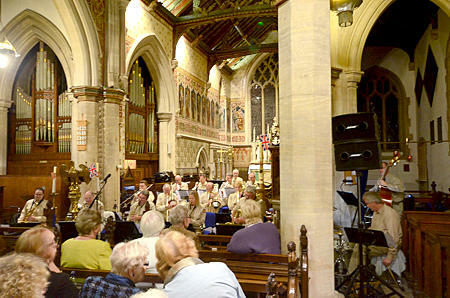 There was a good turnout with excellent music during the service and splendid refreshments afterwards. Thanks to all who helped to make it a great occasion. We welcome David and his family to the Diocese. A big thank you to everyone who helped to make Rev�d David�s service of Institution such a special occasion. Special thanks to Head Mrs Kate Coates for making the school community space available for refreshments after the service. The Rev'd David Cleugh has been appointed as Rector for the Three Rivers Group David is currently Priest-in-charge of the parishes of Leadgate, Medomsley and Ebchester in the Diocese of Durham. Bishop of Ely on Friday, October 20 at 7.30pm in St Peter and St Mary Magdalene, Fordham. We welcome David and his family to the Diocese. David describes himself as a 'liberal Anglocatholic, vegetable grower, dog walker and Mansfield Town fan". David and his wife, Hannah, will reside in the vicarage in Fordham. The Rev'd Dr Hannah Cleugh, formerly Chaplain and Solway Fellow of University College, Durham, has been appointed by the Bishop of Ely as his Senior Chaplain. She is a board member of Affirming Catholicism. 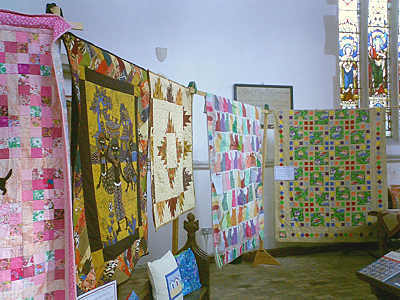 Over the August Bank Holiday we held a very successful Quilts and Quilting exhibition and workshops by �Peacemakers� Group, with refreshments made available in the church Social Centre. 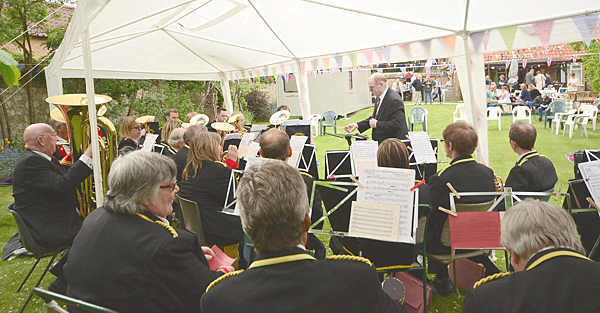 The Annual Band & Blossom Concert featuring the Newmarket Town Band, with a BBQ, was held in the Isleham Social Centre Garden on Sunday May 14. The event was inaugurated to commemorate the life of Graham Wells. After spending the weekend camping near Stroud for �Wheel Nuts� Charity Car Show and The Club AGM Barry Jones and myself start off on Monday morning May 8 from Berkeley Castle in our standard 328cc motorcycle engine three wheel Berkeleys to replicate as near as possible a drive that was done in 1960 by Bob Currie and Andre Baldet that took them all round the UK, as far north as Inverness in a NEW Berkeley, (ours are 57yrs old !!). Sadly, Barry's car broke down on the first day and after a series of dramatic breakdowns - and repairs - Geoff too was prevented from from completing the planned itinerary. However he covered over 800 miles, arriving at Berkeley Close in Biggleswade on Sunday afternoon May 14, (the site of the old Berkeley factory). Many thanks to all who enabled us to meet our goal of raising over �1,500 for Cancer Research. Download an A4 flyer which shows the route and planned daily schedule (PDF file). Geraldine and I have been active members of our village church, St Andrew's Isleham for 40 years. Geraldine had great support from the Church family and Macmillan Nurses, since being diagnosed and successfully treated for breast cancer last year. We aimed to raise �1500 for Macmillan Cancer Support (one � for every mile of our journey. Anyone wishing to donate can do so on my �Just Giving� site Justgiving.com/fundraising/Geoffrey-Dabrowa and gift aid if possible. Alternatively post a cheque to me made out to � Macmillan Cancer Support�. Geoff Babrowa, 22 Beck Rd, Isleham, Ely, Cambs. CB7 5SA tel 01638-780500. 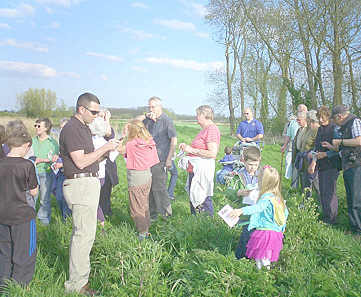 On Saturday May 6 about twenty of us walked from the pond in East Fen Road Isleham, via Ferry Drove to the River Lark on our Annual Spurgeon Trundle. We gathered there by the monument to the Reverend Charles Haddon Spurgeon, who was famous as The Prince Of Preachers. He was baptised there in the river in 1850, and we commemorated the occasion with a very short act of worship. The patron of Fordham and Kennett, Jesus College, invited us to attend choral Evensong in the College Chapel in Cambridge after a short talk from the Dean of College. The farewell Group Eucharist at Isleham last Sunday was a very special time. It was very moving for us, write Mike & Helen, and we are extremely grateful for your very generous gift to us both. It will come in very handy for all the work we are having done to our house in Ely. So THANKS. Very much appreciated. It will be difficult to move on, but these times come to us all, and we support and encourage one another on the journey. You have certainly encouraged and supported us in our ministry with you in these churches and these villages for the past fourteen years. I still have some weddings and baptisms to take, so will see you from time to time. Lunch on Monday at Chippenham Park was another super day, which I hope and pray all enjoyed too. Over 200 of us gathered for a superb hog roast from La Hogue, with salads and desserts. Our grateful thanks to Hugo and Becca Nicolle and Eustace Crawley for their great generosity, and to Louise, Yvette and all their helpers with the food and drink. Peter Maxwell and family make splendid bar persons, and Liz made a very special cake. Judy Burbidge made the table decorations to round off a brilliant day. The election of Churchwardens was held after the principal service in each church on Sunday April 23. 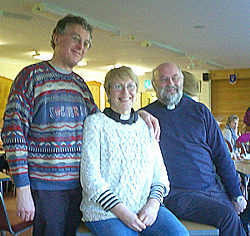 Rob Savage and Kathy Carver were elected as Churchwardens for St Andrew's Isleham. 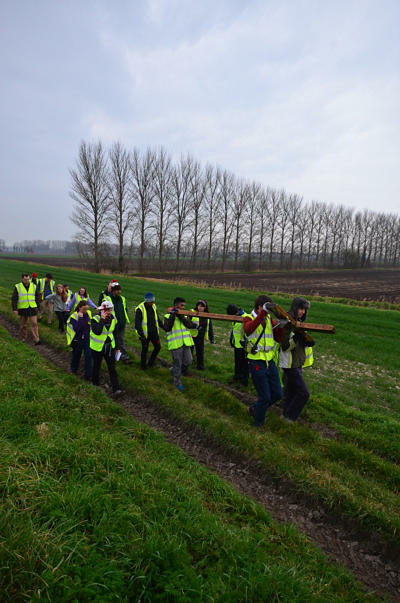 The Student Cross walked through the parish again in Holy Week. They stayed overnight in the Victoria Hall in Fordham and Jenny Bowen and her team of helpers fed them supper and then rose early for the students� breakfast before their walk on Wednesday. 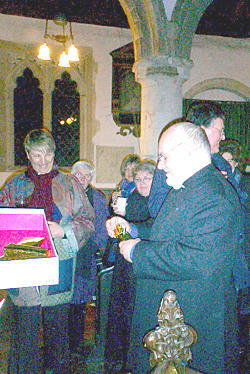 They joined us for Compline on Tuesday evening: it is a delight to be able to offer hospitality to them. A super Saturday at Karma Farm. Many thanks to Bridget, Will and Sheila for hosting and Kath for the catering. Nigel and Alastair for leading us on this Christian Aid event. This Autumn Barbecue event was run by St Andrew's Church, Isleham, and sponsored by Christian Aid as part of their nationwide Week of Action (8-16 October), to tell the government, ahead of upcoming environmental legislation, that we want powerful laws to combat climate change and protect places we love, for example, in our parish, The Wash, with its precious bird life. Alistair Burn told us about the winter migrants that will be starting to arrive, and Nigel Cooper talked about the threats posed to Fenland wetland habitats by climate change. Many thanks to Sue, Helen and Carol for a super service. Thanks to all who have donated contributions to our Gift Day. It is too early yet to say how much we have been given, so thanks to everyone who did and to all those who were in church to receive the gifts. 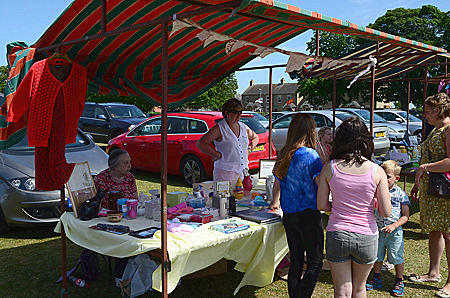 This annual event was held at the St Andrew's Social Centre, Isleham on Sunday May 15. Featuring the Newmarket Town Band, a full barbecue and homemade desserts, and a licensed bar; all those who attended enjoyed a good time. Congratulations to Sue and David on the safe arrival of their grandson Sacha for Emily and Phil on Wednesday April 20. Thanks to Roy and Janet Vatcher for organising the super visit to Prom Praise in the Royal Albert Hall. Nicola Bramley, the Head Teacher at Isleham School for the past eight years, is retiring on Maundy Thursday. She has made a tremendous difference to the school. The church and the whole village and staff, pupils and Governors will thank her at the school service at 2 pm on Maundy Thursday. Nicola will continue to live in Fordham. Dawn and Rhian will be leading the school as Acting Heads in the summer term, and Sarah Skillern will take up the reins as the new Head in September. Last year many members of our church family generously sponsored Fairtrade �Real Easter Eggs� to be given to children who come to Messy Church, and we'll do it again this year. Sue reports that, �there has been a fantastic response to the request for sponsoring Real Easter Eggs. We have 30 eggs for the children who attend Messy church and some money to put aside for next year�s eggs.� Many thanks to everyone who contributed so generously. Our three Mothers' Union Lent Lunches have been very successful and raised over �400. A huge vote of thanks to all who have prepared soup, made the sandwiches, set up the rooms and cleared away. It is really good to be together like this in Lent and to share the discipline. A magnificent event with tons of hard work from everybody concerned. Many thanks to Mark and Nettie for leading the community carols on Sunday at 4pm. Final results as soon as they are known. It�s a real delight to welcome back Carol Taylor as a Licensed Lay Minister to our Group, and Stephen too. Already we are witnessing their strong and prayerful presence among us. Welcome back. Also welcome to Duncan Dalais, a retired priest who lives in Chippenham and who has Permission to Officiate in our Group and across the Diocese too. I am delighted that he will be taking services and assisting us all in our ministries here. The Diocese has instituted a new medal in recognition of the immense contribution so many make not only to their home church, but also to the local community. Terry Cross of Chippenham has been awarded one of the 11 medals given out this year and received it at our Cathedral at Evensong on October 17, St Etheldreda's Day. Congratulations to him! A special service at Ely Cathedral On Sunday September 27 to launch the Strategy, Ely 2025. People fully alive. A strategy for growth. The service to launch the Strategy, Ely 2025. People fully alive. A strategy for growth, was held at our cathedral on Sunday, September 27. Thanks to Peter Maxwell who has been instrumental from our parishes in working on this. 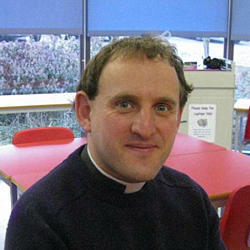 Bishop Steven has appointed Mike to be Rural Dean of Fordham and Quy Deanery as from now. Archdeacon Alex licensed Sue as Associate Priest and commissioned Mike as Rural Dean of Fordham and Quy Deanery on Thursday August 20. A superb Veterans lunch at the Victoria Hall on Saturday September 12 with many from our five parishes present. Huge thanks to Andrew Mead, who paid for it all, Louize Hurst, Yvette Hill and Anomi and her daughter for helping prepare and serve the food and for the willing band of volunteer helpers and the Fordham Guides who made the event so special. 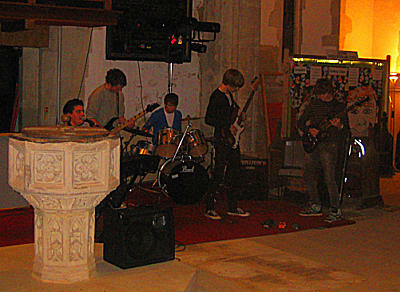 That evening the concert in church was tremendous. Thanks to John Pryke and the Charity Group for all their work. 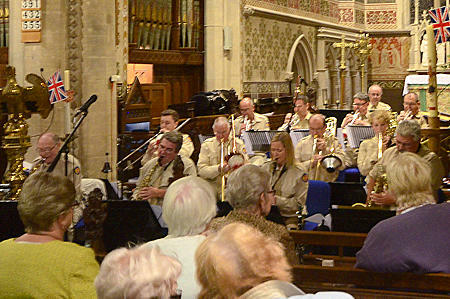 The concert raised over �1600 for the Church, the Fordham Charity Group and The Royal British Legion Poppy Appeal. Above all our thanks to Brenda Lee for her inspiration and detailed work in making sure everything went very smoothly. Our Commemoration concluded with the Group Service at Fordham, on Sunday September 20. A time with folk from all five churches in our parish, super music, and a good time to give thanks. We have purchased a commemorative mug for each primary school child in our parishes, and will give them out soon. 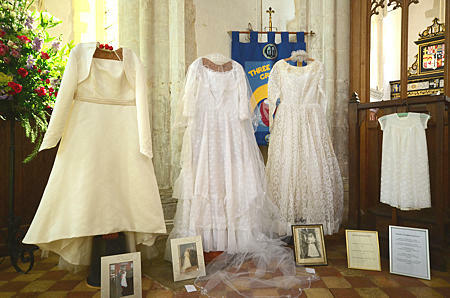 An exhibition of wedding dresses and Christening robes will take place of Saturday August 29 and Sunday August 30 in the church. Refreshments will be available in the Social Centre. The exhibition will be open, and refreshments available, between 10am and 5pm. There are nearly thirty wedding dresses on display along with other memorabilia of the wedding days. Two dresses are over one hundred years old, another has been worn by three generations of brides. The 'Polar Explorers' Holiday Club met at The Victoria Hall in Fordham from 9.30am-noon, from Tuesday to Friday. A huge vote of thanks to Revd Sue, Emma, and the tremendous group of leaders who made this year�s holidays club such a success. The children have thoroughly enjoyed their time and learned a great deal about God�s love and grace in all our lives. Many thanks too, to Rob Savage who constructed the awesome sledge and to so many who made unique and creative contributions throughout the week. Our Holiday Club is now a well established and well loved part of our mission so thank you to everyone who helped and to everyone else who through their prayers grounded the whole activity in God�s love for us. 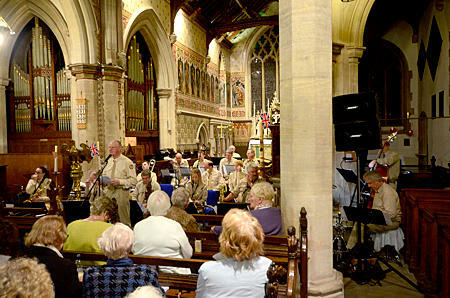 St Andrew�s Isleham has stood at the very heart of the community for several hundred years. It contains not only much of the history of the village, but is also the space for a lively, vibrant, prayerful, community of faith which meets for worship. This equips us for acts of service in our village and beyond. Many come to visit, to witness for themselves the beauty and peace of the building, and to lift their spirits. St Andrew�s is both a source of inspiration to all and a symbol of those eternal values of love, joy and peace which are at the very heart of the universe. Many find a home in our church, and come to celebrate marriage, and for the baptism of children and adults alike and to gather in times of sadness too, for funerals and memorial services. Through offering space for the Post Office at St Andrew�s Social Centre, the church has been able to work with the community to retain the PO in the village, an asset for all. A very generous local donation meant that we could repair the Social Centre roof, and a Government grant from the Repair Roof Fund, means that we can repair the church porch and chancel and vestry roofs too. Our choir thrives, our Sunday School continues to teach the faith to our young people, and our Church of England primary school is a safe and excellent educational experience for youngsters in the village. Many work hard in church and community alike, ringing bells, arranging flowers, welcoming, cleaning and helping in keeping the church alive. We all want to keep St Andrew�s open for everyone. Your contribution is vital in this, for the future of St Andrew�s is in the hands of the whole community. St Andrew�s is entirely self-supporting, receiving no outside grants or contributions for the everyday maintenance and running costs. It�s the church for everyone in our community, so please do give generously to ensure it can remain open for all. Robert Savage, Peter Pedersen, Churchwardens. Thanks to all who contributed to our stall at the Gala, we raised over �150. The church has been transformed and much clutter has gone. Huge thanks to all who came along and helped. 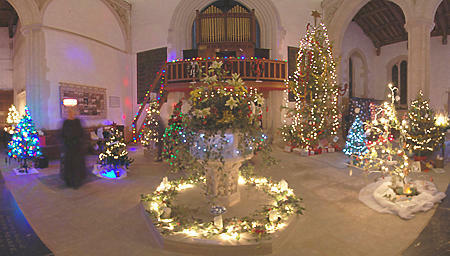 The flower room and vestry are clear and all the lights now work! Thanks. 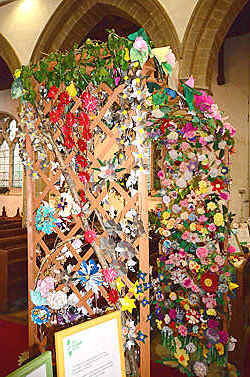 On the left you see a 'floral' arch the near part of which was provided by the Foodbank in Soham. The 'flowers' were all created from rubbish and food packaging. The photo on the right is of the Mothers' Union display. The rain held off and everyone enjoyed the splendid Newmarket Town Band and the excellent barbecue and homemade salads and desserts, not to mention the licensed bar. Over �800 was raised for church funds. Thanks to all who helped in any way to make the day a great success. On a windy but pleasantly sunny Saturday afternoon at 3 o' clock, some twenty-five men, women, children, and a dog called Abby set off from the duck pond in East Fen Road, Isleham, on the 2015 Spurgeon Trundle. For those who haven't heard of the Trundle before, it consists of a leisurely annual walk down East Fen Road, and then along Ferry Drove, to the place at the River Lark where the great Reverend Charles Haddon Spurgeon was Baptised on the 3rd of May in 1850. He had walked all the way from Newmarket to Pound Lane Church - here in Isleham - especially for that occasion. 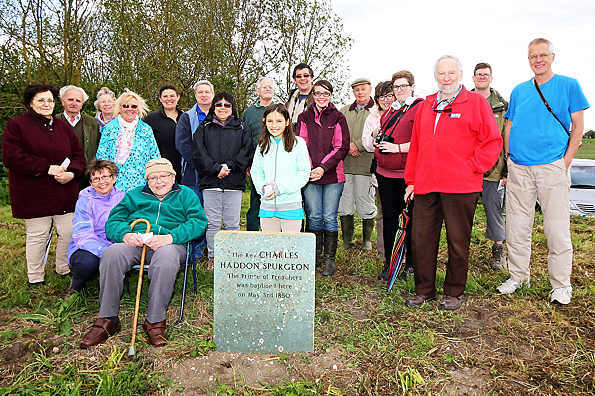 One of Isleham's best-kept secrets is that someone - we are not sure who - placed a memorial stone on the river bank over forty years ago, to mark the occasion where such an eminent Christian began his Baptised Ministry. He was known as 'The Prince Of Preachers,' because during his lifetime, he preached to over 10 million people; all this long before the days of radio and television! 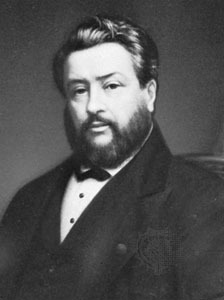 It's worth looking him up on the internet - http://en.wikipedia.org/wiki/Charles_Spurgeon - as he had such an extraordinary career, which has been, and still is, revered worldwide. This Trundle has now become an annual Isleham event, and is something like Chaucer's 'Canterbury Tales,' in the way that those who made the 'pilgrimage' made friends with each other, chatted about all sorts of things on the way, and shared stories with each other. At the monument itself, there was a short act of worship, beginning with The Lord's Prayer, and then the singing of the hymn, 'Jerusalem,' and 'The Grace,' and finally three cheers for Spurgeon! Each 'trundler' was given a brief souvenir handout, which included a photo of last year's 'pilgrims,' some facts about Spurgeon, and an appropriate extract from one of his sermons that he had specially addressed to the farming community. Next year, the Trundle will take place on Saturday the 7th of May 7 starting at 3pm, so put it in your diaries now while you think of it - and, if you've never joined us before, come and do The 2016 Spurgeon Trundle: you'll love it! An excellent meeting at our primary school in Isleham saw some 32 members present. There were quite a few apologies this year as the choirs were meeting at Ely to rehearse for the festival in May and it was the sole rehearsal! Please share your thoughts with the Ministry Team and with Churchwardens and PCC members about how we can pray our way into the future. 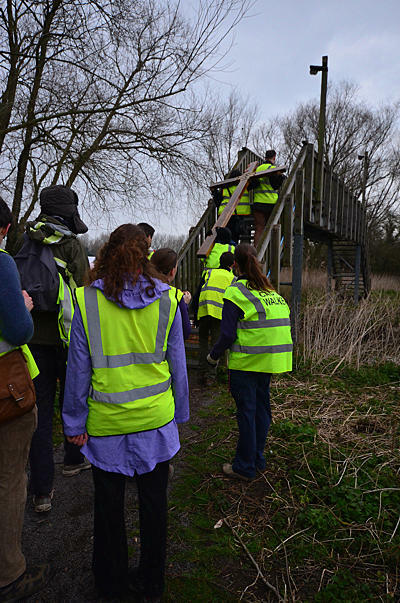 Jenny Gage was licensed on Easter Day at Haddenham to the Grunty Fen group. We wish her well in this new stage of her ministry. 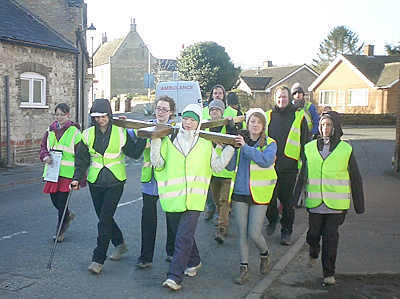 The Student Cross walked through our parishes on Tuesday March 31 and Wednesday April 1. 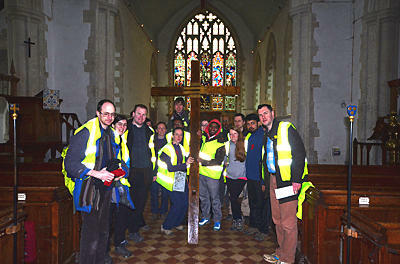 Fordham was the halfway point on their pilgrimage from Epping to Walsingham. They stayed at Fordham�s Victoria Hall on the Tuesday night. They joined with us for Compline and Address on the Tuesday evening and then after their breakfast, they had a short service in church at 8am before they set off for Methwold the longest day on their pilgrimage. It was good to welcome this group to the Parish on Tuesday. Many thanks to Jenny, Doreen and Barbara for preparing dinner on Tuesday and breakfast on Wednesday morning, really early. We hope to welcome them again next year. Many thanks for the most generous gift of a new roof for the Social Centre at St Andrew�s in Isleham. A parishioner saw the state of the roof, and offered to pay for complete re-roofing, so THANKS. It is all very much appreciated, and the roof looks great too. The builders also put new insulation in the roof and evicted the squirrels which have since returned.. This year there were three groups; Sue led the group at Isleham hosted by the Vatchers; Mike led the group at Fordham; and Jan and James Broad hosted and led the group at Chippenham. We used materials produced by the Diocese of Norwich called Mapping Lent which were very interesting. A big thank you to those who have provided homemade soup and sandwiches and those who have supported these lunches. A super time was had by 37 children and a goodly number of helpers in activities, song and fun. A huge thank you to Sue and all who helped to make it such a success. The morning finished with pancakes, of course, and our fervent hope that many will return for our holiday club in the summer. Many thanks to everyone who helped to make last Sunday, our Ride and Stride after Christmas such a good occasion. And thanks to all who helped with the refreshments at the Bowls Club in Fordham when we said fare well to Jenny Gage and Andrew. Jenny will be in South Africa from Friday onwards for about a month, and will be licensed on Easter Day at 4pm at Haddenham. We will go over and support her in this new stage in her ministry. 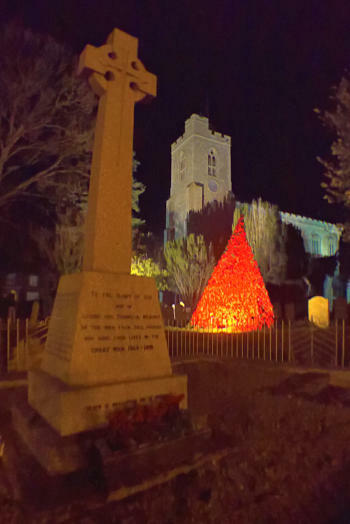 The annual festival of Light at St Andrew's Isleham took place this year on the weekends of December 6/7 and December 13/14. 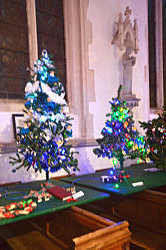 There was a stunning display of about forty decorated illuminated Christmas trees. 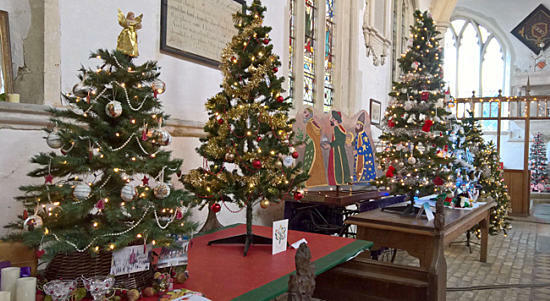 There was a Christmas Fayre on December 6, and on December 14 a Carol Service 4pm. You can view some more photos from the displays in previous years. 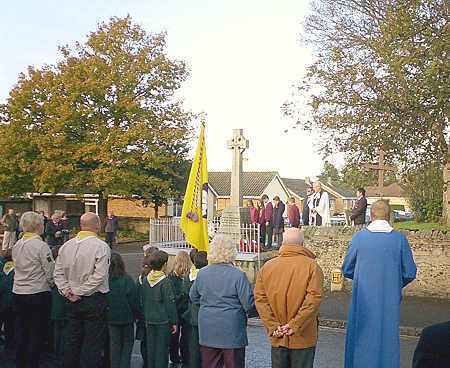 In Isleham we met around the War memorial at 10.45am, and then moved on to church which was full. The Service was led by the Rev'd Nigel Cooper, Chaplain of Anglia Ruskin University. Rev�d Becca Gilbert was licensed in the Lordship Group on Monday 20 October at 7.30pm at Haslingfield Church. Thanks to all who attended from the Three Rivers groups churches. 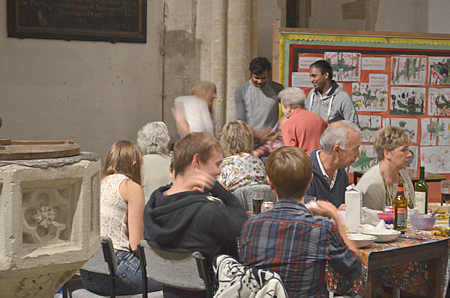 A splendid Harvest supper was enjoyed by members of the congregation and the wider community. Thanks to all who contributed and attended. This festival of flowers, art and music was inspired by our national commemorations of the outbreak of the First World War. 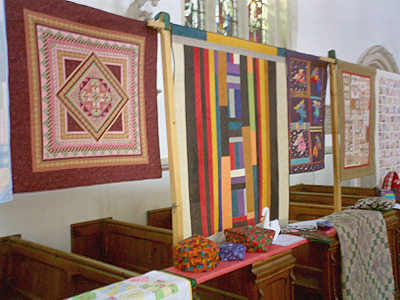 The Quilts and Quilting display was superb. 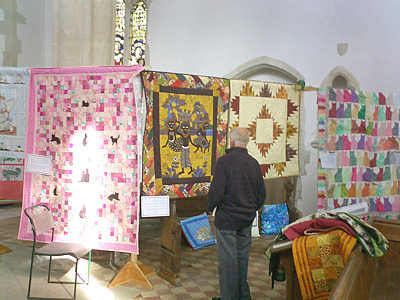 The church was full to the brim with wonderfully crafted quilts of all sizes and colours, demonstrating skill, great craftsmanship and invention. It was also good to see so many old and new friends alike visiting the church and social centre. Grateful thanks to all those who gave their time so willingly to make this a fantastic weekend. A super time last Sunday afternoon with over 65 turning up at the Vicarage to say fare well to Becca and Rich, Minty and Benedict. Becca and Rich have made a tremendous difference in the parishes and will be sorely missed. Becca & Rich would like to say a huge thank you for a wonderful send off on Sunday 17, it was lovely to see so many of you there and we will cherish very special memories of our time with you all. Thank you also for the generous gifts too. Becca's licensing will be on Monday October 20, at 7.30pm at Haslingfield. 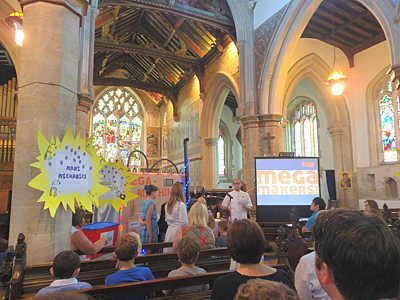 The only morning service in the Three Rivers group this Sunday celebrated the Mega Makers Holiday Club. A fantastic week with tremendous thanks to the huge team of willing helpers making this a significant contribution to our outreach to children in the Three Rivers group. 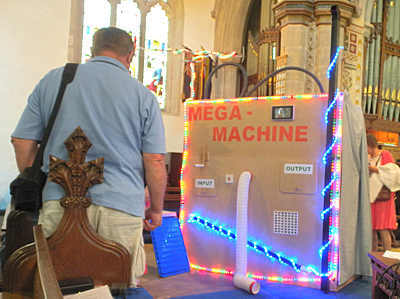 Rob Savage made a magnificent Mega Machine which featured in our service. Many, many thanks to Rich Gilbert and Janine Taylor who led the week so successfully. 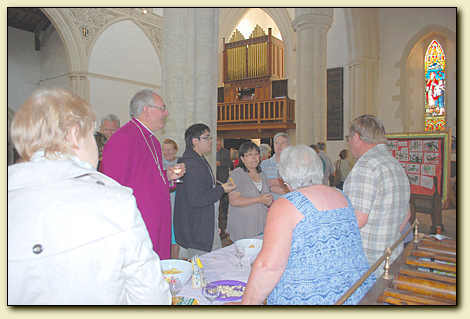 St Andrew's Isleham Gift Day was on Saturday July19. The Christian Aid Walk and collection made over �1000 � way up on last year. It was great to welcome Bishop Stephen and so many others from the churches across the deanery. Our worship was great and the social time afterwards was a tremendous opportunity to get to know each other better. See you at the next one! 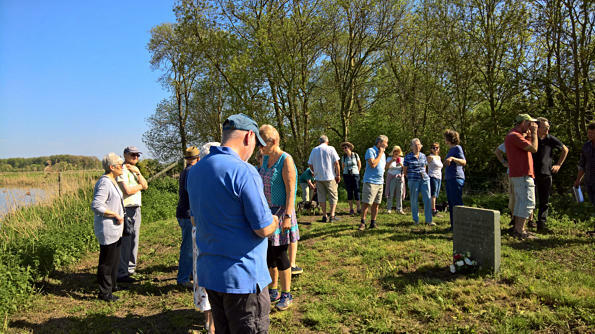 Christopher Goodwins writes - On the 3rd of May, a Saturday afternoon that couldn't have been sunnier, about thirty people met at the pond in East Fen Road, to begin the second annual Spurgeon trundle. At 3 o'clock precisely, after three blasts on a vuvuzela (reminiscent of the rams' horn trumpets at Jericho) we set off along the track, rather like the pilgrims in Chaucer's Canterbury Tales. The time seemed to pass very quickly as we talked, and laughed, and got to know each other, and before we knew it, we were at the left turn into Ferry Drove. 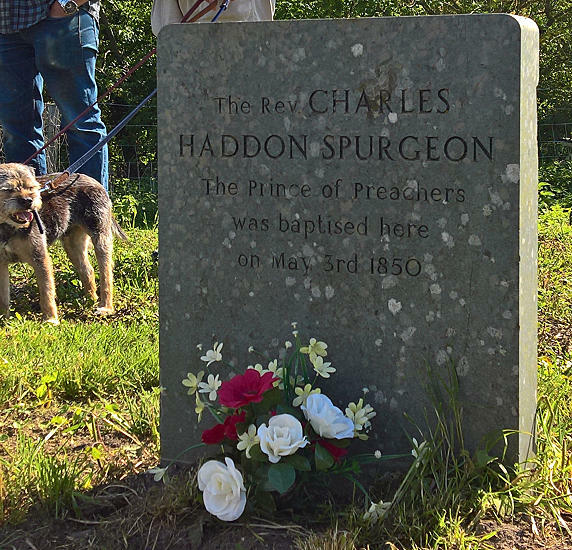 Some who had earlier gone by car met us and walked the last hundred yards to the river bank, where we assembled for a short act of worship, and commemorated the Baptism of 'The Prince Of Preachers,' - the Reverend Charles Haddon Spurgeon, on that very day, 164 years ago. The occasion concluded with three cheers for Spurgeon being made, after which no one seemed to want to go home, but stood around in small groups listening to stories about old Isleham, and the ferry, and what Baptisms were like there years ago - within living memory of some of the people there. Group photographs were taken, but no baptisms took place on this occasion, except for Millie, the golden Labrador who demonstrated how it should be done, by diving straight into the water. 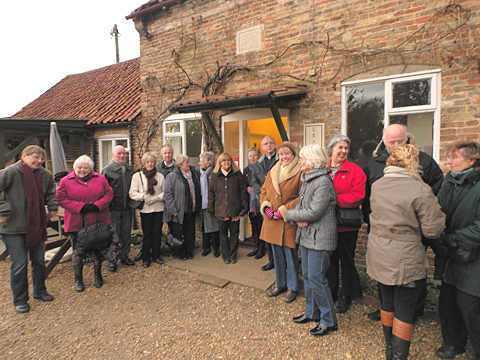 Isleham residents were well represented, as were people from Worlington, Barton Mills, Fordham, and the three Isleham Churches. Peter Flatt had kindly mown the grass on the bank a day or two before, which made access much easier. "Next year in Jerusalem" was not exactly the cry made by people leaving the site, but it was suggested that it could well become a picnic in future years, for those who were prepared to trundle along the paths to Isleham's best-kept secret - the Spurgeon's Baptismal stone on the banks of the river Lark, at the site of the old Ferry. We have a splendid new kneeler made and donated by the Edwards family and dedicated to Cyril Edwards 1937-2013. The funeral service for the late Rev�d David Kightley wwas held on Friday December 20 at Chippenham Church and afterwards at Chippenham Village Hall. David was Priest in Charge of Isleham, Chippenham and Snailwell, and lived in Chippenham from 1976 - 1996. Much loved, he built up the congregation at Isleham from a handful to around 70. He had excellent relationships with the High St and Pound Lane churches. The choir led an evening of carol singing at Limestone Close on Friday December 20 at in the Community Room. 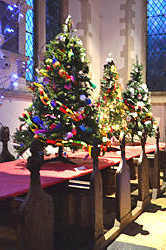 The Christmas Market was on Saturday December 7 and the Christmas trees were in place for both weekends of this great festival. The Community Carol Service was on Sunday December 15 at 4pm and very well attended. 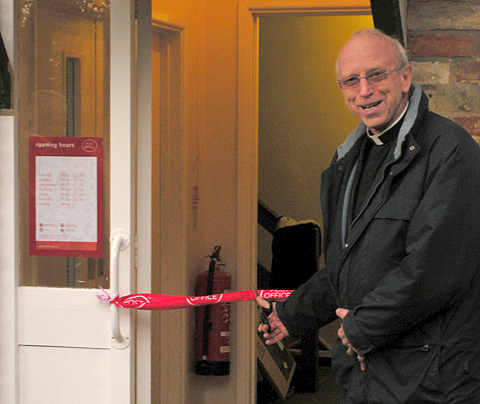 The new Isleham Post Office at the St Andrew's Social Centre was officially opened by the Venerable John Beer, Archdeacon of Cambridge, on Thursday December 5. 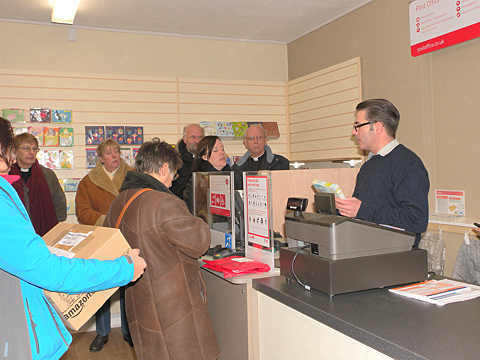 The new Post Office will be open from 9am-5.30pm Monday to Friday and from 9am-12.30pm on Saturday. There will be restrictions on parking at the Social Centre, at least during Post Office opening hours, to avoid damage to the gardens. Rich Gilbert (Becca�s husband) raised �450, half of which goes to the Three Rivers Group, by cycling to all five Group churches; he visited 44 churches altogether travelling over 70 miles. 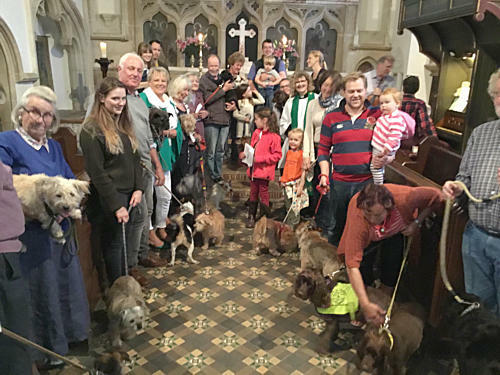 Funds raised are shared between the Group and Cambridgeshire Historic Churches Trust, who organise the event. Last week, we started Messy Church in Fordham. 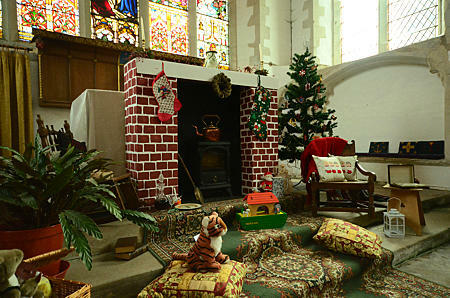 15 children and their parents turned up for an afternoon of craft, play, worship and food. A great team of helpers led under Becca�s supervision. We will do Messy Church once a month every month from now on. If you know anyone who would like to take part, or you would like to help in any way please do speak to one of the Ministry Team, but Becca in the first instance. 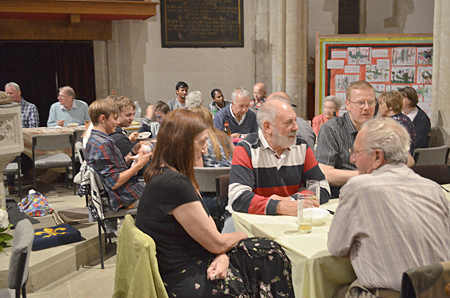 The annual St Andrew's Church Summer Social was held at the Social Centre over the Bank Holiday weekend. Many thanks to all who ran and supported this great weekend. We raised over �1,300, so a welcome addition to church funds. Pyramid Rock Was a tremendous experience both for the young people who took part (some 30 in all) and for the parishes!! This is the first time we have mounted a Holiday Club for some time. 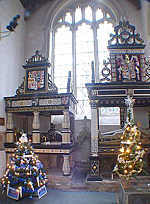 They used to be held in both Isleham and Fordham in the past. It was good too to have such a supportive group of adults leading each of the three groups, contributing to games and sport, leading the music, providing the refreshments, organising the crafts and being prepared to help those who might be injured (mercifully that skill was not called on much). The Archdeacon's Visitation to swear in churchwardens was held at St Andrew's Isleham on Wednesday May 29 at 7.30pm. Over 80 people attended. Christopher Goodwins writes: About forty men, women and children - representatives and others from Pound Lane Church, High Street Church, and The Three Rivers Group - met in East Fen Road on Friday afternoon, May 3, for a leisurely half-hour trundle along Ferry Drove to the River Lark, by kind permission of Mr Derrick Beckett. This novel event was planned to mark what we believe may have been the fortieth anniversary of the siting of a memorial stone, marking the place where the Reverend Charles Haddon Spurgeon was baptised by total immersion in the River Lark on that very day in 1850. He earned the title of 'The Prince Of Preachers,' because his sermons proved to be the most powerful means of persuading thousands of people to become Christians. 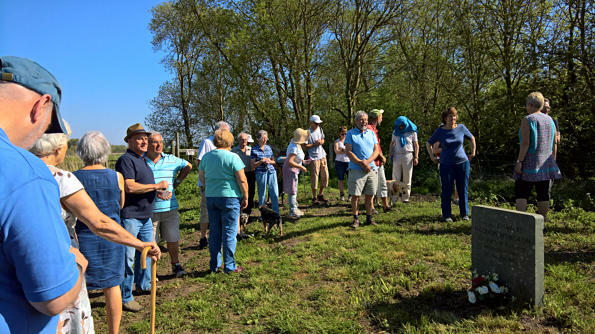 The ecumenical trundle was a relaxed and pleasant occasion in bright sunshine, and a wonderful way of making friends, and getting to know one another. A small souvenir publication was given to all present, with illustrations of former baptisms there, the ferry, Spurgeon himself, and other interesting photos; and Mr Dave Hall, of Pound Lane Church, spent a moment highlighting some of the facts about Spurgeon's great Ministry. It was surprising, however, that nobody seemed to know for certain who put the stone there, who paid for it, or who planned it. Even more surprising is the fact that so few people today even know of its existence, and few have ever seen it. Of all the things that Isleham is known for, the guide books are remarkably silent about the huge importance to the Christian Church of the Baptism of this remarkable clergyman. Our 2013 visit was held to be such a success that we have been asked to make it an annual occasion. Next year, May 3 falls on a Saturday. Now that we all have a year's notice, maybe we could arrange to have our choirs, a brass band, and some hearty hymn-singing at the Spurgeon baptismal stone? Maybe a different aspect of his Ministry each year could be featured, maybe some snippets from some of his sermons, and full Media coverage? Do let us have your ideas, photos, thoughts, and suggestions about next year's visit. But please don't delay � because next May 3 is only about a year away! A lovely evening when 35 members of our churches went to Great Hormead to support Kate, Daniel, Emma and Alice at Kate�s institution as Priest-in-Charge of her new parishes there. Thanks to everyone who came. It was a great evening. A wonderful two weekends of the whole community coming together to celebrate Advent and all our preparations for Christmas. The Carol Service last Sunday was super, so a big vote of thanks to all who made it works so well. We collected about �1,500 towards church funds. Thanks. If you have never been been this year you missed an impressive display of nearly 40 illuminated Christmas trees, donated and decorated by local groups and businesses. 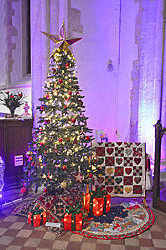 There were more than 45 Christmas trees on display in 2010 as shown in the panoramic image below. Click and drag to rotate the panorama, and use the + and - keys to zoom in and out. Congratulations to Canon Tim Elbourne, who has been appointed as Diocesan Director of Education in the Diocese of Chelmsford. Tim has been in Ely since 1998, and has been Associate Priest here in the Three Rivers Group for the past 12 years. His ministry has been highly valued here and we shall all miss him. Tim�s final services were last Sunday, November 25 at Isleham at 9.30am, and then at Chippenham, with Snailwell, at 6.30pm followed by a reception where he was presented with a selection of 'Essex-themed' gifts, including spray-on fake tan and a guide to Estuary English. 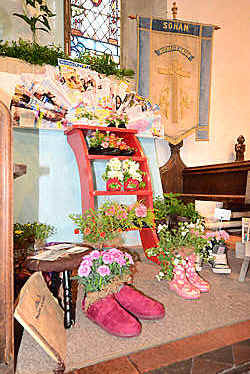 It was so good to welcome our three schools into church for their Harvest Festivals. 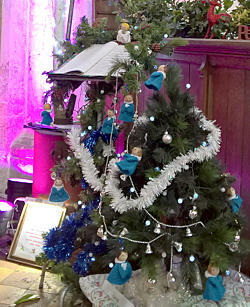 Over 600 children, staff, parents and grandparents attended at Fordham, Isleham & Kennett. A further 250 attended our Harvest Festivals, all followed by Harvest Suppers. Thanks to everyone who contributed, delivered produce and made Harvest such a time of thanksgiving for all. A great weekend of activities last week at Isleham to welcome cyclists from Mildenhall, and many others too. We raised about �1,300. Thanks to all who worked so hard! 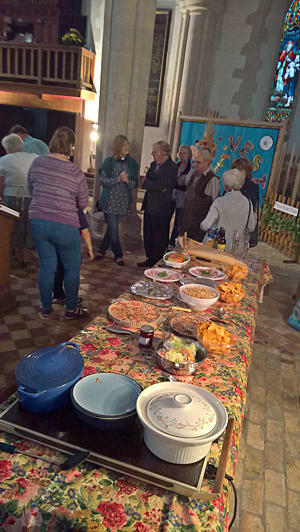 The "Come and Sing evensong" organised by the Archdeaconry of Cambridge Church Music Society on the theme of A Summer Of Celebration at St. Andrew�s, Isleham yesterday was a splendid event. It was open to singers in the Archdeaconry. Music included works by Purcell and Stanford. Many thanks to Mark Liversidge for making this happen in our parish. 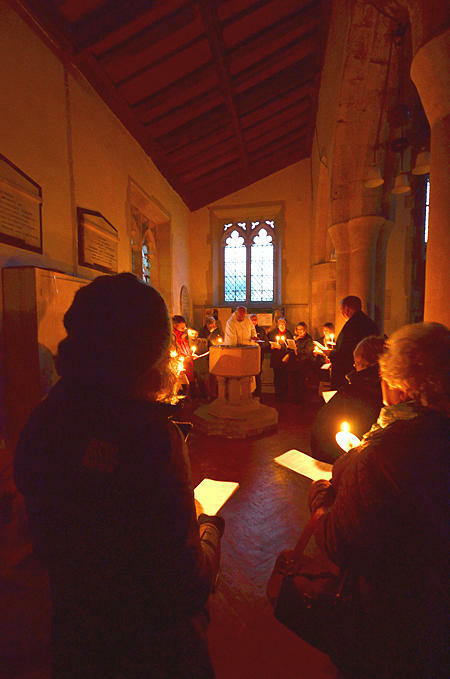 The Isleham Festival of Light was celebrated over the weekend November 26-28 to mark the beginning of Advent. 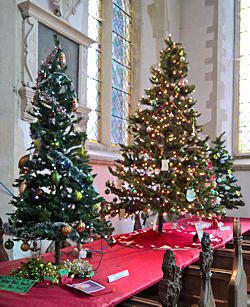 There were more than 45 Christmas trees on display. 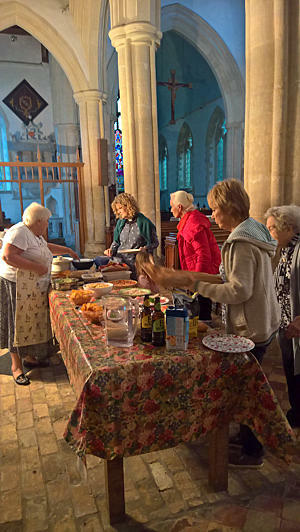 Following the success of last year�s �Sponsored Sleep-Over in Church� for Children in Need St.Andrew�s, Isleham hosted another fundraising event on Sunday 15th December. Their Rave in the Nave in the Styx, inspired by the huge annual event at Ely cathedral, raised over �400 and everyone involved had a great time. There were three bands; Unauthorised, comprising young people who attend Soham Village College; DOC, an established band of local 17/18 year olds; and The Running Mayfairs, who have played several times at The Junction in Cambridge, all gave their time and expenses for free. There were wiifit and playstation games, giant jenga, a tuck shop and brilliant disco courtesy of David Bedford. Sylvia and Bob Allen kindly donated and manned the Bungee Run which proved very popular with the young, and not so young! There were several behind the scenes benefactors to whom we are also very grateful. We hope to make this an annual event and perhaps by holding it on a Friday night and relaxing the age limit we can attract more young people from around the area next year! The music of love in all its many forms laced with flowers, spells and sleep! The Granta Chorale, a choir of 20 - 24 singers, was formed by Janet Wheeler in autumn 2007. Janet Wheeler is a freelance composer and choral conductor and also conducts the Saffron Walden Choral Society and directs several youth and children�s choirs in the area. In 2009 she was commissioned to write a cycle of John Clare settings to celebrate the life and work of the poet. The Granta Chorale gave the first performance of Time becomes a Song in a concert for the John Clare Trust at Glinton in Northamptonshire, close to the poet�s birthplace. This delightful piece formed part of an entertaining and varied programme together with sacred pieces by Monteverdi, Byrd and Durufl�, short atmospheric songs by Britten, Mantyjarvi and Eric Whitacre and much loved jazz standards.